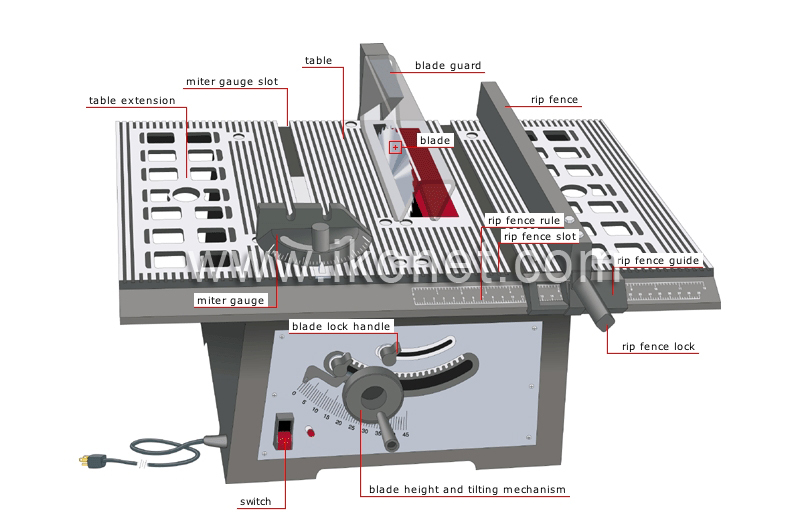 Set composed of a table, a circular saw and guiding accessories, for making straight or oblique cuts to large pieces. Groove containing the rip fence guide and making its slide parallel. Locking handle used to keep the guide still and parallel to the desired spot on the table. Movable accessory for a transverse cut that positions a piece at a precise angle (between 45° and 90°), and guides it toward the blade. Wheel that moves along an angle indicator (between 0° and 45°) and regulates the blade’s height and inclination. Screw locking the blade in the height and tilt settings. Scale showing the distance between the parallel guide and the blade, and, therefore, the width of the cut. Part extending the table’s work surface. Notch in the table in which the miter gauge slides. Flat surface supporting the piece to saw and the guiding accessories. Perforated part whose motion along a track keeps the guide parallel to the exact measure desired.